As the housing bubble inflated, few regulators took notice. If they did, many turned a blind eye. 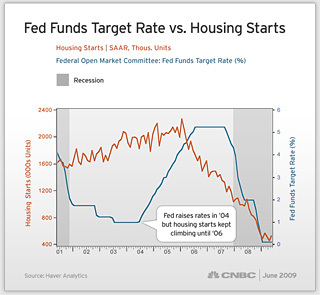 Even Federal Reserve Chairman Alan Greenspan acknowledged during a Fed meeting in November 2002 that "our extraordinary housing boom cannot continue indefinitely." His words turned out to be drastic understatements and they would later come back to haunt him. In a 2005 speech to the Economic Club of New York, Greenspan amplified his earlier remarks about the real estate boom, referring to "froth" in the housing market. It was his most significant acknowledgment that regional bubbles existed in certain parts of the country. But he refused to believe they posed a serious threat to the national economy. Despite his comments, Greenspan did nothing to discourage those local housing bubbles from growing even bigger. Looking back, he still maintains the Fed could have done little to stop it. About the same time, as early as 2002, a pair of lesser-known bureaucrats tried to raise a red flag about subprime mortgage dangers. Sheila Bair, who worked at the Treasury Department, and Ned Gramlich, a Federal Reserve Governor, noticed that half of all subprime mortgages were being made by non-bank lenders, which were poorly supervised and regulated. 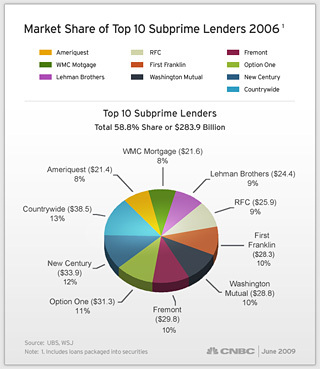 Gramlich and Bair, who in June 2006 became Chairman of the FDIC, tried to convince the Fed to tighten regulation of subprime lenders. Their pleas fell on deaf ears. Greenspan felt new rules and regulations would be useless without proper enforcement. Although the Fed lacked enforcement powers, the Treasury Department and the SECshould have kept a much closer and more critical eye on the massive increase in securitization of subprime loans and the implications for unsuspecting investors. So, while Greenspan's deep, undying belief in free markets may have blinded him to the financial catastrophe lurking in the shadows, other regulators were simply asleep at the switch. Hedge fund manager Kyle Bass was anything but blind. His eyes were wide open and his instincts were dead right. By 2006, Bass predicted the subprime securitization crisis before just about anyone else. As a short-seller known for doing his homework, Bass researched the mortgage and securitizationindustries top-to-bottom, inside and out. Bass discovered a ticking timebomb about to explode and by mid-2006 he figured out how to capitalize on it. Bass based his findings on three key pieces of research: the relationship of housing prices to income, inventory of unsold homes, and the lack of mortgage industry regulation. CNBC anchors and reporters offer their perspectives on warning signs that the housing bubble would burst and send the economy spiraling downward.